LONDON (CNN) -- The British government gave Scotland a precious stone Friday -- and it's about time, say Scots, since it was stolen from them seven centuries ago. 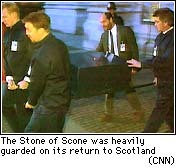 The Stone of Scone (pronounced skoon) left Scotland in shame in the hands of an English conqueror. It returned in triumph to the winsome tunes of bagpipes, though it was guarded closely in a closed Land Rover over the bridge at Coldstream. That's where King Edward I carried off the "stone of destiny" in 1296. The stone, for centuries a coronation seat of Scottish kings, spent recent memory surrounded by other special stones, at London's Westminster Abbey. 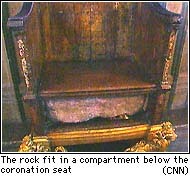 The rock was fitted beneath the seat of a regal wooden chair, and it has been part of every British coronation since it was stolen, including that of Queen Elizabeth II in 1953. One legend says the stone is a fake, as the canny Scots hid the real one when they saw King Edward coming. But the people in Edinburgh's streets Friday gave it a genuine welcome. "Without it we lacked something in the past which we'll be able to have," said one man. "It will give us an identity now." The royal stone will rest in Scotland's unofficial capital, Edinburgh Castle, where it's reported the Scots will charge the public the equivalent of $10 to see it. What the British government bills as a gesture of reconciliation is seen by some Scots as a political ploy by Prime Minister John Major to scrape up a few votes. Scottish nationalists are influential and active. "We'll take what he's giving us back, and then we'll ask for more," said Alex Salmond of the Scottish National Party. "And the more we're going to ask for is not just a symbol of power but the substance, our own democratic parliament." Some Scots would even like to see a Scottish monarch on a Scottish throne once more. Whoever gets the job might want to bring a cushion for the coronation. The old saying, "Heavy lies the head that wears the crown," doesn't begin to express all the discomforts of monarchy.